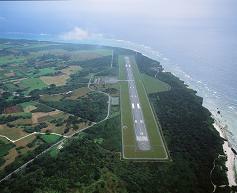 The construction of Tarama Airport as an emergency airport was funded by USCAR (the United States Civil Administration of the Ryukyu Island) in March 1971. The runway was expanded to 800m to comply with the Aviation law, which became applicable along with Okinawa’s reversion to Japanese administration in 1972, and 19-seat DHC-6 aircraft began operating to Miyako and Ishigaki islands. The airport, however, was not able to keep up with passenger demand and frequent bad weather resulted in many flights being cancelled. This was inconvenient for local residents and damaged local promotion. Residents called for larger aircraft and an extended runway. In 2001, the aged DHC-6 aircraft were replaced with 9-seat BN-2B aircraft and this resulted in the worse situation due to the small size. In order to work towards the future expansion of transportation with the improved flight stability and comfort of larger aircraft, construction of a new airport with a 1,500m-long runway to replace the old 800m-long runway airport started in 1999 and began operating from the 10th of October 2003. 1971/12/ 2 Operation of civil aviation started.